The Smith bees made this honey during the second half of July and the beginning of August. It's different from the earlier honey. Similarly runny, but darker, and with a rounded silky taste. Imagine olive oil and chocolate. There were swathes of thistles flowering on Stourbridge Common at the time this honey was being made, so I think there must be a good proportion of thistle honey in here. We extracted 4 frames, which filled 10 jars. The other frames were not fully capped, and have been returned to the bees. 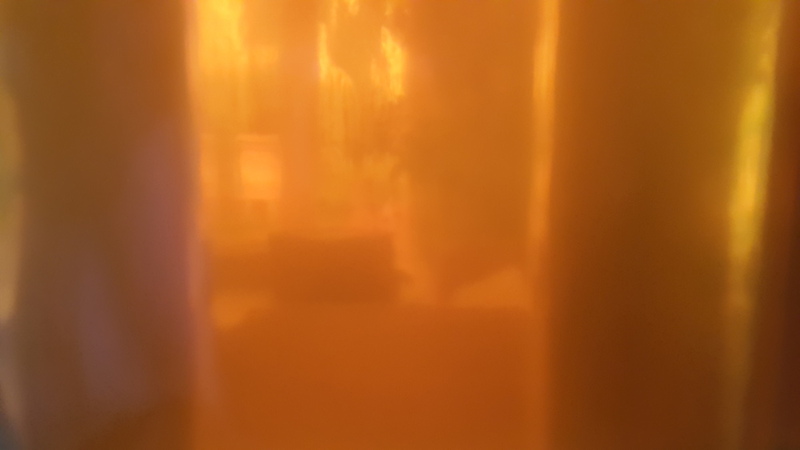 Looking through a honey jar on the dining room table, to the back garden beyond. See the Copper Hive standing in the sunlight? Early Summer and late Summer honeys.